Young men sell vegetables on the street in Gaza, Palestinian Territories, 20 November 2017. Around three million inhabitants have suffered for years from polluted water, massive power cuts and a high unemployment rate. 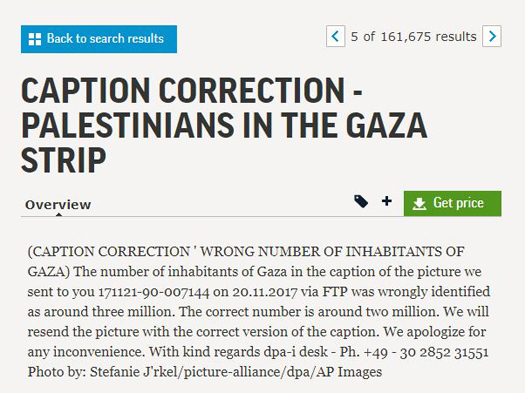 The population of the Gaza Strip is less than 2 million, not “around three million.” According to the Palestinian Central Bureau of Statistics, the Gaza Strip’s population (as of July 2017) is 1.94 million. According to the CIA World Factbook, as of July 2017, the population is almost 1.8 million. CAMERA commends DPA for the timely correction. Additional DPA corrections prompted by CAMERA are available here. This post was updated at 8:07 am EST to include information about the Associated Press.